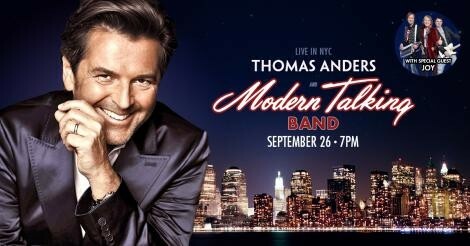 Thomas Anders & Modern Talking Band in New York City - Thomas Anders Online - Die offizielle Fanpage! Das nächste Konzert von Thomas Anders & der Modern Talking Band in den USA findet am 26. September 2015 um 19:00 Uhr im United Palace Theater am Broadway statt. Wir wünschen allen eine tolle Show ! The next concert of Thomas Anders & the Modern Talking Band in the USA will take place at 7 pm in the United Palace Theater on Broadway on September 26, 2015 We wish all a great show!